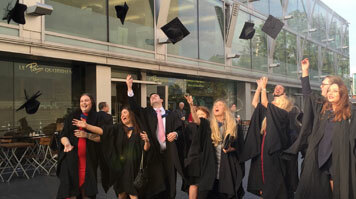 In a ceremony held at the Southbank Centre, graduates collected their awards on stage to the applause of friends, family and fellow students. The latest official figures show that the Creative Industries – including design, film, games, publishing, music, technology and television - generated a huge £76.9bn a year to the UK economy in 2013. LSBU’s School of Arts and Creative Industries prides itself on an approach to learning which gives students broad knowledge to apply to a constantly evolving job market. As part of the ceremony, British Graphic Designer Malcolm Garrett – who gained a global reputation for his influence on graphic design and popular culture – was awarded the title of Honorary Doctor of Letters. In the 1980s, Malcolm Garrett’s work with iconic musicians such as Simple Minds and Duran Duran helped define the visual identity of a generation. Throughout the 1990s, he pioneered the possibilities presented by digital technology. More recently he has become known for both his collaborative approach to design and his commitment to education. Malcolm Garrett is also a tenant at LSBU's Clarence Centre for Enterprise and Innovation.